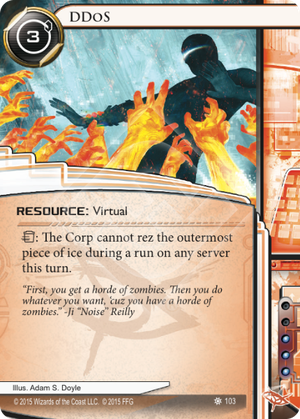 trash: The Corp cannot rez the outermost piece of ice during a run on any server this turn. DDoS stands for Distributed Denial of Service. For you guys who aren't familiar with the term, it is an actual technique of causing internet disturbance, involving hitting the target server with lots and lots of internet traffic by sending loads of packets to it that it has to respond to, quite possibly with a wide array of computers at the same time, infected earlier with a trojan or Remote Administration Tool client - these would be so-called zombies. The goal is to flood the server in question with a number of requests enough to cause it to either respond slower or completely crash, thus denying further service. Enough gibberish. The flavor text of this card says everything - you can literally do whatever you want, because you've got a horde of zombies. Tread where they don't want you as many times as it pleases you. It is an Anarch card that actually fits Criminal a lot more. You are going to put the Corp in a situation where he has money that he can't spend on anything! How messed up is that? Say, a winning agenda is hiding behind an unrezzed glacier. DDoS alone won't let you through, but it is going to make things a lot easier than anticipated. Instead of three ice, there is two you have to pass. And that might just be not enough to stop you. Another example. You're going to stop the Corp in his tracks by launching an early Account Siphon, but the HQ is behind an unrezzed piece. Install DDoS and all of a sudden there is no problem. What's more, the Corp doesn't even have anything he could spend these credits on, because he's been DDoSed. And now he's also bankrupt, with an useless piece of ice before he manages to catch up. The combination with False Echo has been described above in great detail. I shall waste no more of your time with it. You were happily digging with Medium on an unprotected R&D, but then some jackhole has put a scary ICE there. Launch DDoS and keep digging. High chances of getting a quick, clean victory. Firing Apocalypse with DDoS on board is made so easy that it's almost poetry. I'd also like to add that I love the art on this card. SUPERHOT comes to mind. Ready to become an online necromancer? DDoS now costs additional three pips per piece regardless of faction due to level 3 MWL restriction, which brings it to whopping six influence for non-Anarchs. This seems to make it a lot less reliable. DDoS is still a strong option, yes, but since it's really expensive to slot more than one copy, it best be used as a failsafe, backup or plan B - the additional costs really limit its potential use in combo decks. Haha, not anymore! Let's get back to making zombies! I just saw a beautiful play on Jinteki.net combining False Echo and DDoS : but the question remains, would the combo make it so that multiple False Echos can be used in one single run with DDoS? Would each ICE be counted as the outermost ICE when the previous one was bounced with False Echo during that same run? It was a beautiful combo with two Hyperdrivers and a Keyhole in conjunction with the previously mentioned combo: the runner had 10 clicks in just one turn to run with Keyhole multiple times for free on an RnD that had no rezzed ICE, hence, False Echo could bounce the ICE in a single run and continue to hammer RnD with Keyhole. If the DDos & multiple False Echos combo does't work in a single run, it is still great if you have all those Hyperdriver clicks and just bounce one ICE at a time and afterwards hammer RnD with Keyhole.